Some of the first questions people have about modular homes involve the septic systems. While modular home septic systems are not too different from the plumbing systems of site-built homes, they do have a few particularities that you want to keep in mind. At the end of the day, modular homes are built to even higher quality specifications and regulations than site-built homes. So, while it’s important to educate yourself about the differences between home types, always keep in mind that manufactured homes are excellent homes. What are the main differences between modular home vs. site-build home septic systems? 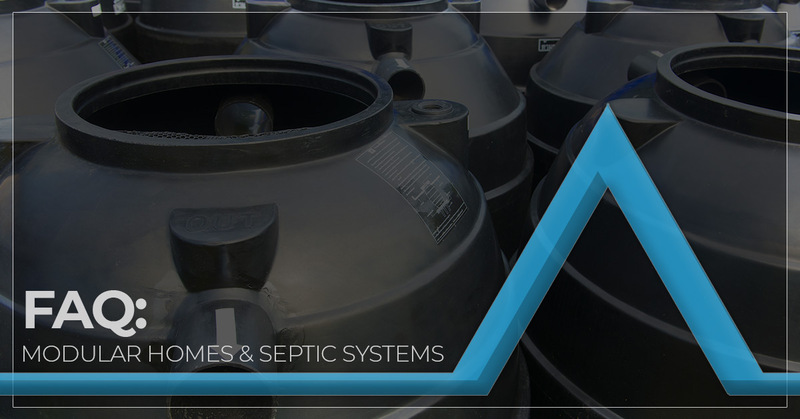 In general, the septic systems for modular vs. traditional homes are consistent. They involve: piping systems, waste disposal systems, pipe venting, a water heater, and water valves. Why does the plumbing run under the floor? In a manufactured home, plumbing lines typically run under the floor to reduce any chance of leakage and wall damage. Additionally, having pipes right under the floor means they’re a lot easier to access. While having pipes under the floor makes them more prone to freezing, a good modular home manufacturer installs proper insulation to mitigate this problem. Will my modular home have proper ventilation? One of the most off-base myths about modular homes involves poor plumbing ventilation. This couldn’t be further from the truth. As we mentioned, manufactured and modular homes are held to extremely stringent building codes. Federal law requires all modular homes to have proper ventilation, including a direct vent through the roof (VTR). The VTR regulates air flow and maintains healthy pressure in your pipes. Similarly, many people assume that modular homes do not need clean-outs (plumbing that prevents sewage from clogging in pipes). However, modular homes require clean-outs in the same way that stick-build homes do. Plumbing code states that a clean-out must be installed where any plumbing fixture creates a 360-degree angle before reaching the home’s main drain. What type of drainage will my manufactured home have? Because your manufactured home will be built in a facility, it will come ready with drain lines already installed. When your home reaches its site, the on-site crew will connect this pre-installed drain line to your waste removal system (either public sewage or a personal septic system for your home). If you have any more questions about manufactured homes and their septic system specifications, be sure to contact our modular home building company in Marion. We’d be happy to answer any questions you might have and to provide more information about modular home building. We feature high-quality modular homes of all different floor plans and sizes. Be sure to contact us today in Marion for the modular home of your dreams.